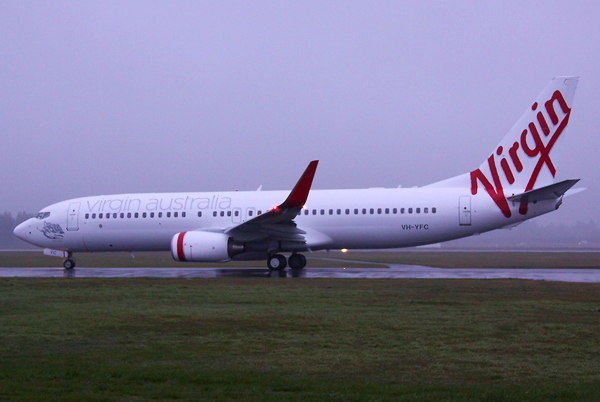 Virgin Australia the "new" number two carrier in Australian skies will launch in 30 mins at SYD. Unfortunately after all the hype and everything that has proceeded it, the new livery for Virgin Australia is um well a complete let down. Im sorry Virgin Australia but Im am completely underwhelmed by your new look, and certainly hope that your new product & service will be good, cause your new look isnt going to grab that much desired market share. The below photo is from Tim W from jetspotter.com - taken as VH-YFC taxied at CHC on departure to SYD for the unveiling. it looks like the logo is falling off the plane? Yeah - I dont like the way the V has been cut off.